Giorgio Bassani’s acclaimed novel of unrequited love and the plight of the Italian Jews on the brink of World War II has become a classic of modern Italian literature. Made into an Academy Award—winning film in 1970, The Garden of the Finzi—Continis is a richly evocative and nostalgic depiction of prewar Italy. The narrator, a young middle-class Jew in the Italian city of Ferrara, has long been fascinated from afar by the Finzi-Continis, a wealthy and aristocratic Jewish family, and especially by their daughter Micol. But it is not until 1938 that he is invited behind the walls of their lavish estate, as local Jews begin to gather there to avoid the racial laws of the Fascists, and the garden of the Finzi-Continis becomes an idyllic sanctuary in an increasingly brutal world. Years after the war, the narrator returns in memory to his doomed relationship with the lovely Micol, and to the predicament that faced all the Ferrarese Jews, in this unforgettably wrenching portrait of a community about to be destroyed by the world outside the garden walls. Giorgio Bassani was born in 1916. From 1938 onwards he became involved in various anti-fascist activities for which he was imprisoned in 1943. His works include The Gold-Rimmed Spectacles, and Five Stories of Ferrara (Within the Walls), which won the Strega Prize. 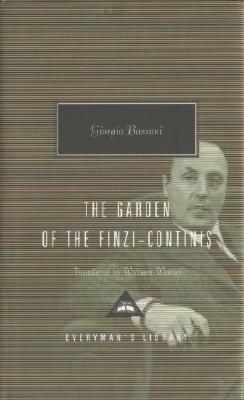 The Garden of the Finzi-Continis was awarded the Viareggio Prize in 1962 and was made into a feature film. William Weaver was an award-winning poet and translator. He died in 2013.